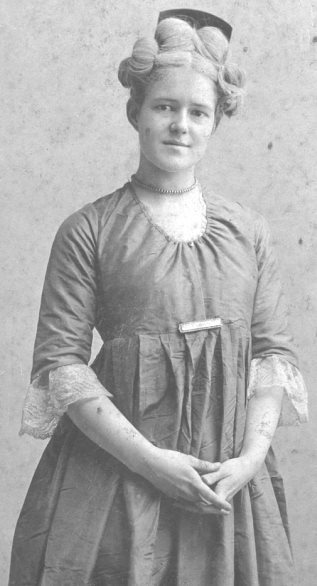 Nina Louise Winn (1877-1958) was the daughter of George Prentiss Winn (1846-1907) and his wife Melissa Sarah Bacon Winn (1853-1886). In 1901, Nina was living with her widowed father and her brother George Albert Winn (1873-1942) at 146 Mystic Street, Arlington, MA. This 1908 photo is of Nina dressed in Colonial dress, participating in an Arlington Historical Society event.